(AV8RSTUFF Creation): Marine Fighter Attack Squadron 235 (VMFA-235) was a USMC squadron that (most recently) flew F/A-18 Hornets. 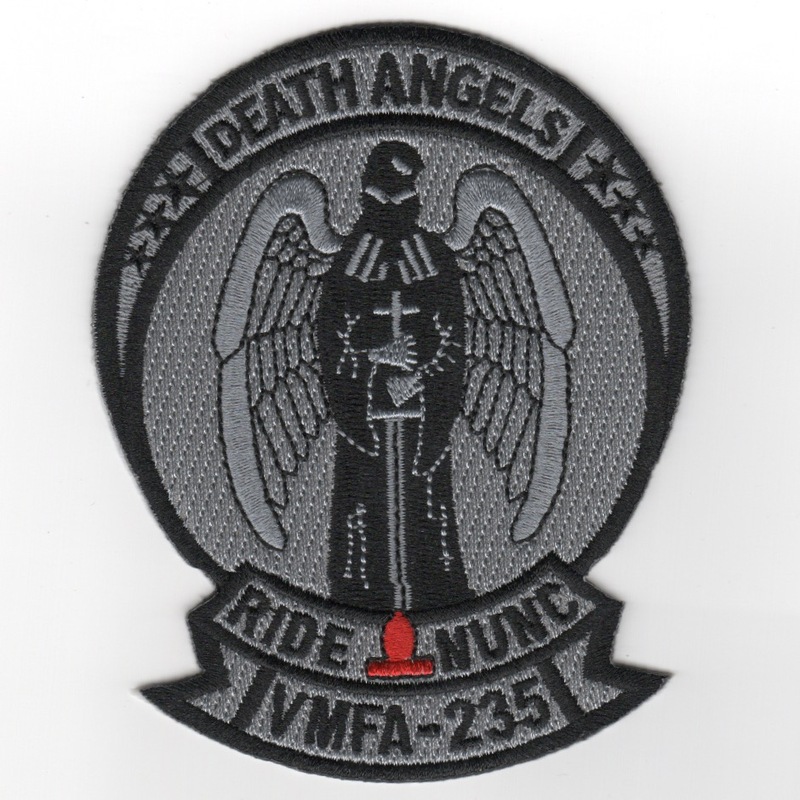 Known as the "Death Angels", the squadron participated in action during World War II, the Vietnam War, Operation Desert Storm and was decommissioned on June 14, 1996. This version of the squadron patch was created from their historical logo (note the Angel Wings and cutouts on either side of the 'tab' at the bottom. This patch does come with velcro attached. The "Death Angels" of VMFA-25 currently fly the F/A-8C Hornet from MCAS Kaneohe Bay, HI. They transitioned from the F-4 Phantom after 22 years with that venerable aircraft, and now operate under the guidance of MAG-24. They were the last USMC squadron to fly the Phantom and this is the subdued gray version of their squadron patch. The squadron has since been decommissioned. This patch does not come with velcro attached. (AV8RSTUFF Creation): Marine Fighter Attack Squadron 235 (VMFA-235) was a USMC squadron that (most recently) flew F/A-18 Hornets. 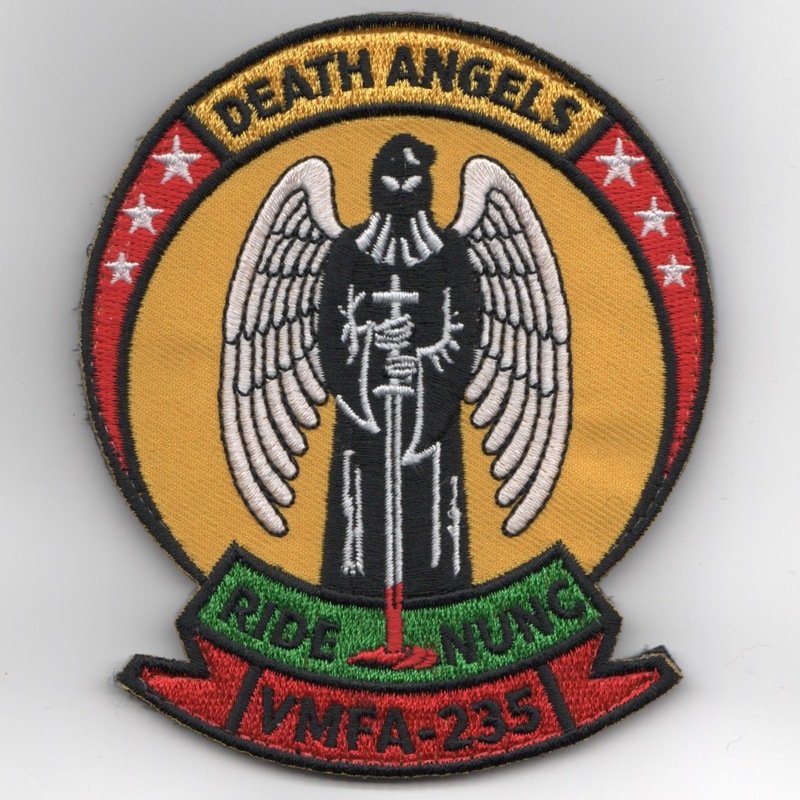 Known as the "Death Angels", the squadron participated in action during World War II, the Vietnam War, Operation Desert Storm and was decommissioned on June 14, 1996. This is the 'bullet' version of their aircraft patch and does come with velcro attached. The "Death Angels" of VMFA-25 currently fly the F/A-8C Hornet from MCAS Kaneohe Bay, HI. They transitioned from the F-4 Phantom after 22 years with that venerable aircraft, and now operate under the guidance of MAG-24. They were the last USMC squadron to fly the Phantom as this patch denotes. The squadron has since been decommissioned. 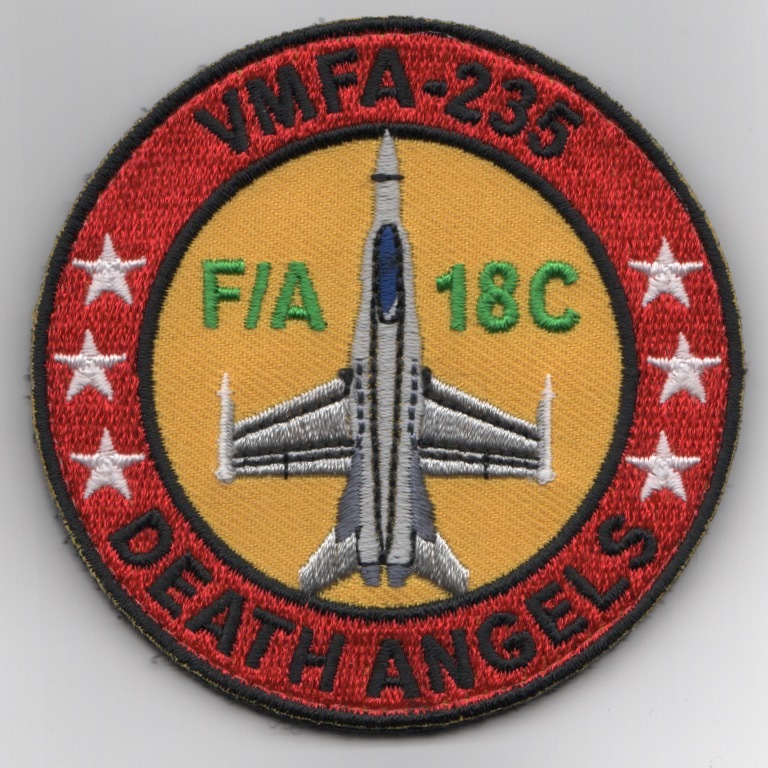 Homepage | Order VMFA-235 Patches!